This pdf from 4 Winds Fantasy Gamingis 6 pages long, 1 page front cover, 1 page editorial, leaving 4 pages of content. So, what is this line? 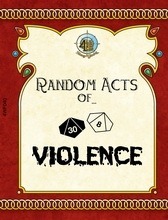 Essentially, we get 100 system-neutral acts of violence that you could theoretically roll a d% and look what happens. While most have some kind of rather generic backdrop, the idea per se is nice – essentially, each of these acts of violence could spark off an adventure or at least an encounter and they range from flying darts to frying pans to the head. If you’re running an urban campaign with an impending revolution or have some emotions-manipulating foe pulling the strings, this table may provide some nice ideas. Editing and formatting are top-notch, I didn’t notice any glitches. The pdf adheres to a printer-friendly b/w-two-column-standard and comes with extensive bookmarks. Essentially, the pdf provides exactly what it promises and does so well. However, it’s also system-neutral, which means that we don’t get any crunch. There is nothing per se wrong with it, but it also does not go beyond its basic premise. That being said, my final verdict will be 3.5 stars, rounded down to 3.